While the power and dark intensity of Petite Sirah can be often overwhelming in its youth, I have found such wines to be remarkably enjoyable after several decades in the bottle. Inevitably, Petite Sirah’s evolution is a slow one, with the wine stubbornly clinging to its primary elements long after other varieties have traded in their fruit for earth. 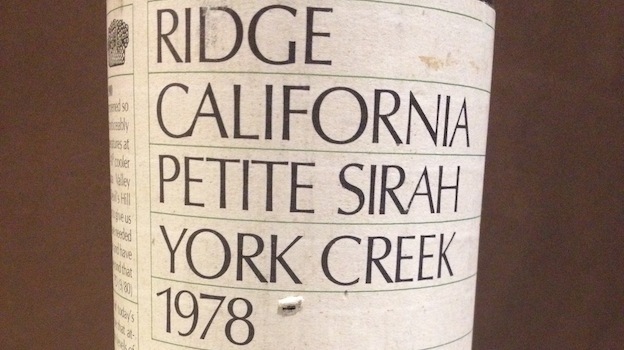 Ridge’s 1978 Petite Sirah York Creek represents old California at its best. Still impressively dark in hue, this timeless wine offers a complex nose of sweet black currants, shoe polish, sandalwood, leather, rosemary and a hint of violet. On the palate, the 1978 is rich and deeply flavored, with an intensely concentrated, succulent fruit and a bright whip of acidity on the finish. While certainly mature, the 1978 is not at all tired, and is undoubtedly capable of further aging. 93/Drinking Window: 2016 - 2026.